Easter 2019 will begin with Good Friday on April 19 and give Britons a four-day weekend ending with the Easter Monday bank holiday on April 22. 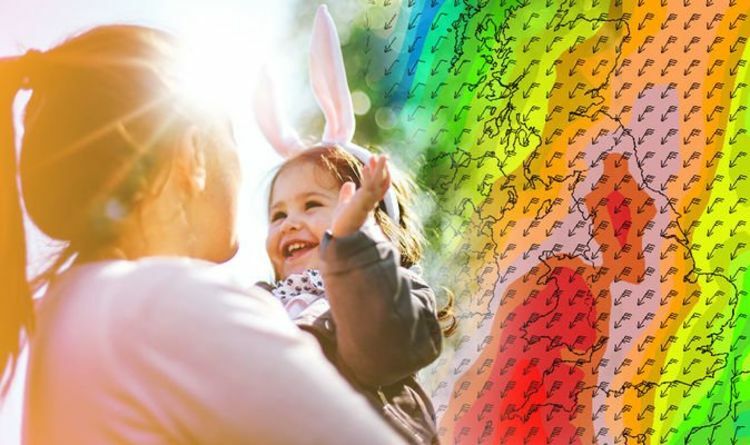 And as the nations get ready for egg hunts and time off, it looks like they will be able to enjoy it with record-breaking temperatures and sunshine. This year’s celebrations are currently seeing odds at 2/1 of becoming the hottest Easter on record, according to bookies Ladbrokes. Alex Apati of Ladbrokes said: "We're not yet putting all our eggs in one basket this Easter, but we're not yet ruling out a record-breaking few weeks ahead." Although a detailed weather forecast is not available yet, the Met Office has offered some clues of what’s to come. For the period April 12 to 26, the weather service said: “As is typical for spring, there is a lot of uncertainty in the forecast as we go further through April. “However, weather systems are expected to push in from the Atlantic at the start of this period. READ MORE: UK weather forecast: Britain to BASK in three-month heat - will April be hottest one ever? “As such the most unsettled and wettest weather is likely to be in the north and northeast, whilst it should stay drier towards the south and southwest. “There are then some indications that a blocking pattern could develop through the middle of the month allowing for more settled weather generally. “Some wetter interludes are still likely though, these perhaps mainly affecting the west and southwest. Another reason this Easter could be especially warm is because it falls relatively late. Easter can be celebrated at anytime between March 22 and April 25, and this year’s holiday is coming towards the end, with Good Friday starting on April 19. A Met Office spokesman has previously told Express.co.uk the temperatures is looking more likely to be above average than below this spring. A Met Office spokesperson also previously told The Sun: "The probability UK average temperatures will fall into the warmest of our five categories is 50 per cent. The coldest category is 10 per cent.